Have you been procrastinating on a moving chore because your vehicle wasn't big enough? 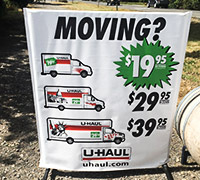 The CVM Store is a U-Haul Dealer. We have In Town cargo vans and box trucks available for rent starting at $19.95 per day, plus mileage and fees. The perfect vehicles to get your moving chores done. We also carry moving boxes and moving supplies!